Donating land to a nonprofit conservation organization such as a land trust or to a public conservation/agency, is the most straightforward method of permanent land protection, and it results in the greatest direct tax benefit for the donor. There are many ways to donate land. Conveying land by gift to a land trust or other conservation agency transfers ownership and management responsibilities from you the recipient, ends the burden of your property taxes, provides you with maximum income tax and estate tax benefits, and avoids the capital gains tax which would be incurred if you sold the land. A land donation can be structured to allow you to continue to live on the land by donating a remainder interest and retaining a reserved life estate. You may also choose to donate land by will, continuing to own and control your land during your lifetime, but assuring its protection after your death. Most important, the donated land will be protected in perpetuity. If you or family members own or retain adjacent or nearby property, you may benefit from its proximity to conservation land. Generally, the fair market value of the donated property is tax-deductible as a charitable contribution. You avoid capital gains taxes upon the land. You reduce the size of your estate, and thereby reduce the amount of state and federal estate taxes. 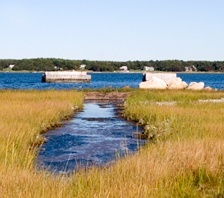 The donation of land to a land trust or conservation organization by will (only known as bequests, testamentary gifts, or devises) has become an increasingly popular technique for conserving land in Massachusetts. Recipient organization should be consulted before including the gift in your will. Reversibility: you can re-write your will at any time to remove the donation if your financial situation or intentions change. You can donate property during your lifetime, and reserve the right for yourself, and other persons you specifically designate, to continue using the property during your lifetimes. When you and those you have specified either die or release their interests, the land trust/agency assumes full title and control over the property. The value of the gift for tax purposes is the value the remainder interest, i.e., the length of time reserved for personal use. This is determined by subtracting the value of the reserved life estate (determined from actuarial tables) from the appraised fair market value of the property. The longer the period of reserved use (i.e., the younger the donor or specified holders of the reserved life estate), the lower the value of the remainder interest, and so the value of the gift for tax purposes will be commensurately lower. The values are determined from IRS actuarial tables based on average life expectancies. The income tax advantages of this strategy are less than from an outright donation, but they are greater than from a gift by bequest. You can generate badly needed funds for conservation purposes by donating real estate of any kind to support the work of your local land trust or other conservation agency. Property that does not have special natural features or that is not suited for permanent management by a conservation organization may be a candidate for such a donation. Two easy ways you can generate badly needed funds for open space purchase and protection and reap major tax benefits for yourself are donations of Trade Land and donation of land through a Charitable Remainder Trust. A donated commercial property, or a single family home, a condominium or other type of real estate can provide tremendous rewards for the non-profit organization, and can create substantial tax benefits for you. The recipient organization can resell the property, subject to appropriate restrictions to protect any conservation values, and use the proceeds to benefit its conservation programs, including the purchase of critical lands elsewhere. This method maintains your real estate in its present form and use, keeps it in private ownership, and on the tax rolls, and allows the land trust to use proceeds from the sale for its conservation work. By establishing a Charitable Remainder Trust, you can protect land, provide significant, immediate, and long-term tax benefits, and assist in your family estate planning. In the case of real estate, this is an excellent way to increase income from a low-yielding asset. You, the donor, with the advice of an attorney experienced in planned giving techniques, establish a Charitable Remainder Trust. Please contact Jim Bride, Executive Director, at jbride@sippicanlandstrust.org or (508) 748-3080 for more information about donating land to Sippican Lands Trust. Thank you!